I believe in the glove. I believe in Kevin Kiermaier, climbing the wall, flashing leather. I believe in his legs, and his heart. I believe that if anyone can chase down a fly ball, it is Kiermaier. I believe in the professionalism. I believe that on his way from this drill to that one, Evan Longoria is going to get his work in. There isn't a lot that is silly about Longoria, which is why he was able to squeeze a very good year out of his body last season. I believe that he can do it again. I am trying to believe in the arm. Yes, Chris Archer can get too cute on the mound, and he gives up too many flies that end up on the wrong side of the fence. But I still think he has enough ability to be a .500 pitcher. If he gets 30 starts, that should help. Archer still has swing-and-miss stuff. He just misses with it too often, which makes him fall behind in counts. What else is there to believe in? I believe the outfield can turn doubles into long fly outs. I believe Alex Colome shows no fear. I believe that Brad Miller might not equal last season's 30 home runs, but he'll come closer than you'd think. A few days short of the opener, that isn't an extensive list for a fan looking for a reason to believe, is it? We're like any other baseball community; we want to think it's going to be an interesting year. We sift through the questions, looking for answers, to satisfy the standings. Still, the skeptics are out, and they have sharp teeth. They believe in fifth place. They believe in bad baserunning. They believe in spotty infield defense. They believe that Rays' fans are going to see too darned many strikeouts. The skeptics? They believe in the Red Sox and Blue Jays and Yankees. They believe in big contracts. The Rays' predictions? They're somewhere between pestilence and death, between the swamp and the quicksand. There are skeptics who think the Rays are a punch line. They believe – say the power ratings of covers.com – that the Rays will be the 25th best team in baseball. Could they be better? Sure they could. But look at the positional rankings of the eutawstreetreport.com. It isn't promising. According to the website, the Rays are worst in the AL East at designated hitter. They are the worst in the AL East at catcher. They are the worst in the AL East at second base. They are the worst in the AL East at shortstop. They are the worst in the AL East in the bullpen. Egad. Tampa Bay is fourth in the division in right field and left field. It's third in the division at first base, third base and center field. Its starting rotation, according to US Today, is 10th (third in the division). So is there hope? Even a little? Sure there is. In predicting sports outcomes, the easiest thing to do is the slot a last-place team in last place. How upset can its fans be? Hey, back in 2008, the year the Rays went to the World Series, you can find predictions that said the Rays would finish fourth in their division. In other words, if the Rays are ever going to be good again, they'll do it by sneaking up on everyone else. Personally, I would bump the Rays up a slot or two in center, at third and at second. If Matt Duffy gets healthy, maybe at shortstop. If there is a problem area with the Rays, it's health. Already, Tampa Bay faces an opener without Wilson Ramos, without Duffy and without Colby Rasmus. For this Rays team to be interesting, it's going to have to be healthy. And it's going to have to have several players have better seasons than you'd imagine. Souza? Kiermaier? Duffy? It's going to have to have some players approximate last season – Longoria, Miller, Colome. It's going to have to be solid at pitching. It's going to have to do the little things better. Big hits. Big defense. Big pitching. Look, the season doesn't open until Sunday. You'd like to believe for a little while, wouldn't you? Great article Gary. If we care about the Rays at all we have to believe in something. I believe there will be entertaining games with some exciting dramatic finishes. I believe will will see some great defensive plays from Longoria and Kiermaier. 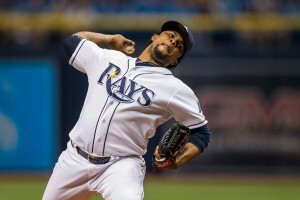 Archer will have some dominate performances and maybe Alex Cobb too. We have to believe Colome is the real deal and not a 1 year wonder. I’m not getting my hopes up for a good season though. I can’t believe in a fairy tale season like 2008 just yet. The health issue keeps biting the Rays over and over again. Lots of players in MLB get hurt but the Rays sign these guys who are coming off surgeries and then use lack of health as reasons for not winning. It’s just not a good recipe for success.